The screenwriting duo who penned four of the Saw sequels have been tapped to rewrite the God of War movie script. Executive producer, David Self, a notable screenwriter in his own right, wrote the initial draft for Universal's upcoming God of War adaptation, but the studio has chosen Patrick Melton and Marcus Dunstan to hammer out the kinks. The pair are known for writing Saw installments IV, V, VI and 3D, as well a handful of other horror scripts. Their mostly highly regarded film is 2006's Feast, which managed to reach the lofty heights of a 56 percent fresh rating on Rotten Tomatoes. The film is being produced by Charles Roven and Alex Garnter, both of whom are also working on a film adaptation of Naughty Dog's Uncharted. Rush Hour and X-Men: The Last Stand director, Brett Ratner, had previously been attached to the project, but it's unclear if he's still involved at this point. 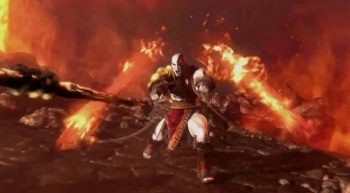 There's no news on which actor will take a razor blade to the dome and cover themselves in talc in order to play perpetually-grumpy anti-hero, Kratos. Judging by previous efforts to bring videogames to the big screen with the care and attention their mythos demands, my money is on Shia LaBeouf.